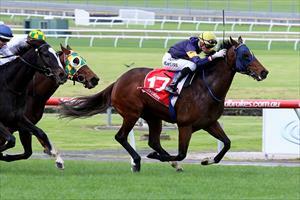 Lord Barrington and Real Gent are our runners on Sunday as they head to the turf track at Geelong. Lord Barrington (pictured) runs in race nine, the Benchmark 84 Handicap over 1140m with Patrick Moloney to ride from barrier nine. It will be the fifth run this campaign for the six-year-old, beaten under 2-1/2 lengths last start when fifth at Caulfield. “The wider draw is probably in our favour as the track is heavy and wider out is usually the spot to be at this track,” Moroney said. “There doesn’t look to be a huge amount of speed in the race so I’d be anticipating he can get across without having to be used up too much. Import Real Gent is in the last race of the day, the Benchmark 64 Handicap over 1340m with Jordan Childs to ride and jumping from barrier one. Real Gent was in a hurry to get his Australian debut over with at Echuca last month and Moroney is expecting a more disciplined display here. “He just got excited and over-raced terribly,” Moroney said. “He’s been better at home since, more relaxed and has come through that run well. We’ve put the ear muffs on to help him for today. “I’d be expecting him to settle just behind the speed as we have to take advantage of the barrier.